Invite everyone’s favorite forgetful fish to a sea-themed celebration by hanging up this adorable Finding Dory Pull String Pinata. 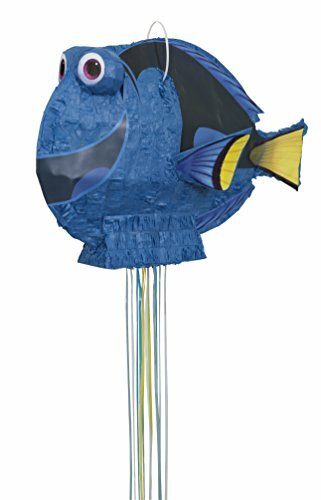 With enough room inside to fill with 2 pounds of candy and fin-tastic favors, this pull-string pinata is sure to be the highlight of any child’s Finding Dory birthday party. Get peace of mind about little Dory fans accidentally injuring themselves with this party pinata. Instead of whacking it with a bat, guests just have to pull on the correct hanging string to release the goodies inside. No hitting required! Best of all, since this pull pinata won’t be destroyed during the aquatic affair, the birthday boy or girl will be able to save it when the party is over to proudly display in their room as a deep sea decoration.